Good Morning! Hello from Kuala Lumpur International Airport! It’s vacation time and we have just embarked on our first real vacation after four long years! Cambodia is our destination and we are in transit in KL airport from Singapore. 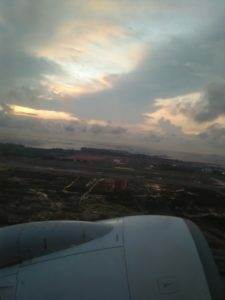 I bid adieu to Singapore taking in the aerial views of Gardens by the Bay, Marina Bay Sands and Esplanade and seeing the sky glow in its beautiful golden orangy hues even as the sun rose. Singapore to Kuala Lumpur takes hardly 45 minutes by flight. 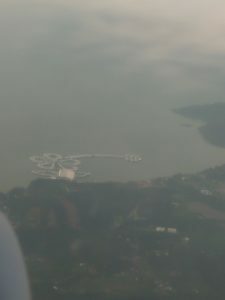 I saw some beautiful aerial views of islands, rivers and palm trees before landing in KL. The airport in Kuala Lumpur reminds me of the airport in Hyderabad. In a short while from now, we will be departing to Phnom Penh, Cambodia. This entry was posted in Travel on September 22, 2018 by admin.